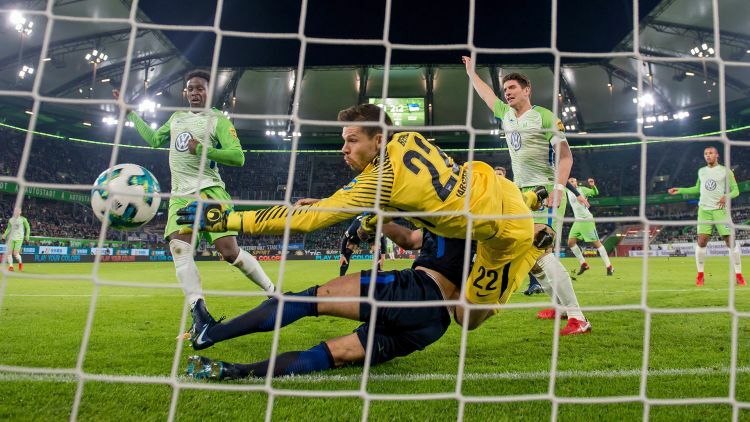 Wolfsburg knew they were getting their hands on a rough diamond when Divock Origi signed on loan from Liverpool in the summer, and after an excellent start at the Volkswagen Arena the Belgium striker is really beginning to sparkle. There was a palpable sense of excitement when the Wolves managed to lure Origi away from Anfield on the final day of the summer transfer window, with the club’s sporting director Olaf Rebbe delighted to have brought one of Europe’s brightest attacking prospects to Lower Saxony. It didn’t take long for the 22-year-old to start proving Rebbe right. On Matchday 5 he scored his first goal for the Wolves in a 1-1 draw with Werder Bremen, before helping his side come from two goals down to grab a 2-2 draw with champions Bayern Munich at the Allianz Arena. But it is since the international break in October that Origi has really begun to slip through the gears, with a sizzling run of three goals and one assist in four Bundesliga outings. With four goals in nine appearances, he is now Wolfsburg’s leading scorer this season ahead of Daniel Didavi. Origi has been named in the starting line-up for eight of his nine appearances this term, and on the sole occasion where he came off the bench – against Schalke on Matchday 10 – he made a significant impact, scoring a 93rd-minute equaliser to rescue a 1-1 draw and extend Wolfsburg’s unbeaten run to six games. After netting 21 goals in 77 appearances for Liverpool, the Belgian was loaned out to Wolfsburg in order to earn regular game time and sharpen up his finishing, and so far the plan is proceeding admirably. In fact, Origi appears to be enjoying himself so much in Germany that he has hinted at the possibility of making his loan deal permanent next summer. Origi also confirmed that Liverpool coach Jürgen Klopp had “not contacted [him] lately”, although the former Mainz and Borussia Dortmund boss – who knows the Bundesliga like the back of his hand – will surely be keeping an eye on his loaned-out striker from afar. Origi (l.) was on target in the 3-3 thriller with Hertha but Wolfsburg have still only won one game all season. Origi will be away on international duty with Belgium in the coming days, and may have a chance to add to his 23 caps and three goals for the Red Devils in upcoming friendlies against Mexico and Japan. If he keeps up his excellent form in the Bundesliga, he looks all but guaranteed a spot in Roberto Martinez’s squad for next summer’s FIFA World Cup, four years after announcing himself on the biggest stage of them all with a memorable late winner against Russia in the group stage in Brazil. Powerful, prolific and versatile, Origi’s star is most definitely on the rise, and his next challenge with Wolfsburg is an obvious one: after a frustrating run of nine games without victory, including eight draws, the Belgian sensation needs to help the Wolves get back to winning ways.